Duh and Sah’s relationship is more than just Sun sign compatibility of Taurus and Cancer. No individual is a pure Taurus or Cancer but instead is a unique combination of signs and planets. The following interpretation defines the synastry or interplanetary aspects between the planets in Sah’s birth chart and the planets in Duh’s birth chart. There is no evil planet in the combinations. No single combination can make or break the relationship. The list goes from the most harmonious (positive) to the most discordant (negative). Sah’s Moon Trines Duh’s Jupiter (+15.82 harmony) – Sah’s emotional needs combine very effortlessly with Duh’s sense of growth, expansion, or generosity. There is harmony in the right mood and feeling of comfort in the relationship. Sah encourages and nurtures Duh’s expansive ideas. Duh is patient, tolerant, protective, and will not harbor any ill-will against Sah. Both boost confidence and respect in each other. This aspect is conducive to fertility and childbearing if the wife’s health and age can support it. There’s a sense of luck and financial benefits from Duh to Sah. An element of teacher and student energy is present in the relationship. The roles can reverse and both take a turn in learning from and teaching each other. Sah’s Moon Trines Duh’s Mercury (+9.43 harmony) – Sah’s emotional needs combine very effortlessly with Duh’s mentality and powers of perception. There is harmony in the intuitive knowledge of each other’s ideas and views. The relationship facilitates good communication and understanding. Both have many similar interests and encourage each other’s mental development. 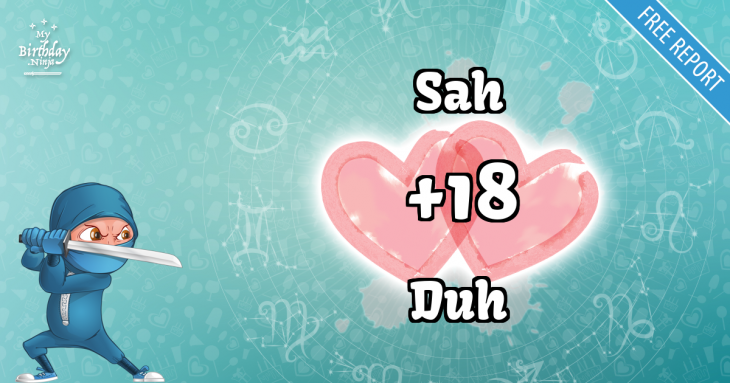 Duh and Sah are often in complete agreement with each other. Sometimes they can interpret each other’s dreams. Duh’s Venus Trines Sah’s Pluto (+8.14 harmony) – Duh’s sense of sexuality, attraction, or intimacy combines very effortlessly with Sah’s sense of transformation, change, or power and destiny. There is harmony when both enjoy moving forward and growing through the relationship. There are feelings of relief and enlightenment after a relationship challenge. The magnetic attraction between Duh and Sah makes it impossible to separate them permanently. Sah’s Mercury Trines Duh’s Uranus (+7.22 harmony) – Sah’s mentality and powers of perception combine very effortlessly with Duh’s sense of independence, freedom, and originality. There is harmony in the intellectual and mental awakening between Sah and Duh. Both bring out each other’s innate genius and encourage its development. The relationship generates tremendous creativity in each other. Communication flows smoothly. Both enjoy the frequent exchange of challenging ideas. Sah’s Venus Trines Duh’s Neptune (+4.66 harmony) – Sah’s sense of sexuality, attraction, or intimacy combines very effortlessly with Duh’s sense of spirituality, imagination, or mystical inclination. There is harmony in each other’s mutual interest in nature, religion, art, music, or arcane studies. The relationship brings out kindness, sympathy, and generosity toward each other. Sah is willing to overlook Duh’s faults. Duh is delighted to be loved in such a sophisticated manner. Duh’s Mercury Trines Sah’s Neptune (+4.42 harmony) – Duh’s mentality and powers of perception combine very effortlessly with Sah’s sense of spirituality, imagination, or mystical inclination. There is harmony when Sah inspires the creativity of Duh. Duh’s practical suggestions give form to Sah’s abstract ideas. Both can discover many interests through excellent communication. The relationship brings a feeling of great pleasure and happiness through sharing of creative projects. Sah’s Moon Sextiles Duh’s Pluto (+4.34 harmony) – Sah’s emotional needs combine pleasantly with Duh’s sense of transformation, change, or power and destiny. There is stimulation in the magnetic mental attraction between Sah and Duh. Both are supportive and psychologically intimate with each other. The relationship can be profoundly sexual. This aspect is suitable for any political, professional, or business partnership. Duh’s Venus Sextiles Sah’s Neptune (+4.22 harmony) – Duh’s sense of sexuality, attraction, or intimacy combines pleasantly with Sah’s sense of spirituality, imagination, or mystical inclination. There is stimulation in each other’s mutual interest in nature, religion, art, music, or arcane studies. The relationship brings out kindness, sympathy, and generosity toward each other. Duh is willing to overlook Sah’s faults. Sah is delighted to be loved in such a sophisticated manner. Duh’s Jupiter Trines Sah’s Uranus (+3.63 harmony) – Duh’s sense of growth, expansion, or generosity combines very effortlessly with Sah’s sense of independence, freedom, and originality. Duh’s visions are in harmony with Sah’s creative genius. Duh will expand Sah’s goals and creativity. Sah adds innovation and excitement to Duh’s projects. This aspect brings out humanitarian qualities in each other. Duh’s Venus Trines Sah’s Mars (+3.56 harmony) – Duh’s sense of sexuality, attraction, or intimacy combines very effortlessly with Sah’s sexual drive, temper, and powers of self-assertion. There is harmony in the desire of Sah and loving nature of Duh. Both are strongly attracted to each other. This aspect is favorable in marriage and offers a fulfilling relationship. Duh’s Mercury Trines Sah’s Uranus (+3.31 harmony) – Duh’s mentality and powers of perception combine very effortlessly with Sah’s sense of independence, freedom, and originality. There is harmony in the intellectual and mental awakening between Duh and Sah. Both bring out each other’s innate genius and encourage its development. The relationship generates tremendous creativity in each other. Communication flows smoothly. Both enjoy the frequent exchange of challenging ideas. Duh’s Venus Sextiles Sah’s Saturn (+3.17 harmony) – Duh’s sense of sexuality, attraction, or intimacy combines pleasantly with Sah’s sense of commitment, necessity, or duty. Sah’s protective nature stimulates Duh’s loving nature. Trust is a rare and precious part of the association. This aspect is good for a long-term relationship. Sah’s Jupiter Trines Duh’s Uranus (+2.64 harmony) – Sah’s sense of growth, expansion, or generosity combines very effortlessly with Duh’s sense of independence, freedom, and originality. Sah’s visions are in harmony with Duh’s creative genius. Sah will expand Duh’s goals and creativity. Duh adds innovation and excitement to Sah’s projects. This aspect brings out humanitarian qualities in each other. Sah’s Saturn Trines Duh’s Neptune (+2.48 harmony) – Sah’s sense of commitment, necessity, or duty combines very effortlessly with Duh’s sense of spirituality, imagination, or mystical inclination. Sah’s practical instincts are in harmony with Duh’s visions and dreams. Sah has a good sense of reality that Duh might not have. Duh is aware of a different dimension that can help Sah. Duh’s Saturn Trines Sah’s Neptune (+2.30 harmony) – Duh’s sense of commitment, necessity, or duty combines very effortlessly with Sah’s sense of spirituality, imagination, or mystical inclination. Duh’s practical instincts are in harmony with Sah’s visions and dreams. Duh has a good sense of reality that Sah might not have. Sah is aware of a different dimension that can help Duh. Duh’s Jupiter Trines Sah’s Neptune (+1.96 harmony) – Duh’s sense of growth, expansion, or generosity combines very effortlessly with Sah’s sense of spirituality, imagination, or mystical inclination. Duh’s expansive dreams are in harmony with Sah’s intuitions. Both are spiritually compatible. The relationship encourages idealism and charitable instincts in each other. Sah’s Moon Sextiles Duh’s Venus (+1.84 harmony) – Sah’s emotional needs combine pleasantly with Duh’s sense of sexuality, attraction, or intimacy. The relationship stimulates deep mutual devotion and affection in each other. Both tend to be liberal on financial matters. Sah and Duh have common interests in many things including social activities. There is a strong attraction for love and marriage between Sah and Duh. Duh’s Mars Sextiles Sah’s Uranus (+1.71 harmony) – Duh’s sexual drive, temper, and powers of self-assertion combine pleasantly with Sah’s sense of independence, freedom, and originality. The relationship stimulates confidence in each other. Both will benefit from a sense of adventure and creativity as a team. Sah’s Mercury Conjuncts Duh’s Jupiter (+1.56 harmony) – Sah’s mentality and powers of perception combine with Duh’s sense of growth, expansion, or generosity. Wit and humor are abundant in the relationship. Exchange of ideas is enthusiastic and friendly. Sah’s ideas combine with Duh’s dreams. Duh’s faith deepens Sah’s intellectual self-confidence. Duh sympathizes with Sah’s desire for mental advancement. Sah respects the moral, spiritual, and intellectual abilities of Duh. Duh’s Sun Conjuncts Sah’s Venus (+1.35 harmony) – Duh’s sense of identity, ego, will, and character combine with Sah’s sense of sexuality, attraction, or intimacy. Duh has the same social interests and cultural values as Sah. There is an increased understanding of one another. The relationship encourages love, happiness, contentment, and creativity. Both Sah and Duh enjoy each other’s company. Duh’s Neptune Sextiles Sah’s Pluto (+0.70 harmony) – Duh’s mystical or spiritual inclination combines pleasantly with Sah’s sense of transformation, change, or power and destiny. The spiritual urge of Duh stimulates the reforming urge of Sah. Both will support and encourage each other’s spiritual enlightenment. The relationship inspires each other to meet the world with compassion and grace. Sah’s Neptune Sextiles Duh’s Pluto (+0.51 harmony) – Sah’s mystical or spiritual inclination combines pleasantly with Duh’s sense of transformation, change, or power and destiny. The spiritual urge of Sah stimulates the reforming urge of Duh. Both will support and encourage each other’s spiritual enlightenment. The relationship inspires each other to meet the world with compassion and grace. Duh’s Jupiter Conjuncts Sah’s Saturn (neutral) – Duh’s sense of growth, expansion, or generosity combines with Sah’s sense of commitment, necessity, or duty. There is a perfect balance of opposing qualities. Sah’s practicality fuses with Duh’s expansive ideas. Duh provides vision while Sah creates structure. Both work better together to achieve success. This aspect is also favorable in a business partnership. Sah’s Neptune Conjuncts Duh’s Neptune (neutral) – The individual sense of spirituality, imagination, or mysticism combines with ease within the couple. Both Sah and Duh share the same tastes in art, music, or religion. The relationship encourages positive traits of creativity and dreaminess. It also has the tendency to promote negative characteristics of laziness or indecisiveness in Sah or Duh. Sah’s Uranus Conjuncts Duh’s Uranus (neutral) – The individual sense of independence, freedom, and originality combine with ease between the couple. Both Sah and Duh complement each other’s individuality and independence. There is mutual appreciation in the relationship. Both bring out the eccentric side of one another. Sah’s Moon Conjuncts Duh’s Uranus (neutral) – Sah’s emotional needs combine with Duh’s sense of independence, freedom, and originality. The fusion excites mutual interest and is intellectually stimulating. There’s a degree of spontaneous, unexpected, and magnetic attraction linking Sah and Duh. Boredom is never a problem in the relationship. Sometimes Sah’s traditional attitude clashes with Duh’s odd behavior. The union arouses romantic feelings that can be temporary unless other harmonious aspects support it. Sah’s Moon Conjuncts Duh’s Neptune (neutral) – Sah’s emotional needs combine with Duh’s sense of spirituality, imagination, or mystical inclination. The fusion offers strong compatibility with each other. A robust psychic connection exists between Sah and Duh. Both have an affinity in mystical, esoteric, or even occult studies. There is a minor irritation when both seem distant or aloof to the other. Sah’s Mercury Conjuncts Duh’s Mercury (neutral) – The individual mentality and powers of perception combine with ease between the couple. There is a similarity of ideas and way of thinking. Both are able to communicate intellectually to handle mental tasks. Sah and Duh have a similar approach to solving problems even if they have different educational backgrounds. Their two minds learn from each other. Both can read each other’s thoughts. Communication is never a problem and both never run out of topics to discuss. Sah’s Pluto Conjuncts Duh’s Pluto (neutral) – The individual sense of transformation, change, or power and destiny combine with ease within the couple. Sah and Duh enjoy the same cultural references. Duh and Sah have a great time talking about the good old days since both came from the same generation. Sah’s Venus Opposes Duh’s Pluto (-0.45 discord) – Sah’s sense of sexuality, attraction, or intimacy confronts and challenges Duh’s sense of transformation, change, or power and destiny. There is an intense and sometimes uncomfortable sexual attraction in the relationship. There is tension in dealing with issues of jealousy, possessiveness, and volatile emotions. The association may breed anger and even hatred of one another. Sah’s Mercury Opposes Duh’s Pluto (-0.91 discord) – Sah’s mentality and powers of perception confront and challenge Duh’s sense of transformation, change, or power and destiny. Duh has a natural tendency to dominate if Sah appears weak. There is tension in the relationship that both Duh and Sah will be uncomfortable with each other. The intensity can sometimes feel overpowering. Sah might have difficulty being heard out of fear of making Duh unhappy. Duh’s Saturn Squares Sah’s Uranus (-1.75 discord) – Duh’s sense of commitment, necessity, or duty interacts stressfully with Sah’s sense of independence, freedom, and originality. There is friction in the conservative principles of Duh and the progressive nature of Sah. Duh will restrict Sah’s progress and expression of individuality. Sah will rebel against the traditional and controlling character of Duh. Sah’s Mars Conjuncts Duh’s Pluto (-2.61 discord) – A delicate combination of Sah’s sexual drive, temper, and powers of self-assertion with Duh’s sense of transformation, change, or power and destiny. There is resistance to the display of authority by the other. Both can be vindictive toward each other. The relationship is extremely competitive for Sah and Duh. Duh’s Saturn Opposes Sah’s Pluto (-2.99 discord) – Duh’s sense of commitment, necessity, or duty confronts and challenges Sah’s sense of transformation, change, or power and destiny. There is tension in the relationship when Duh and Sah compete for influence and dominance. Sah may try to reform Duh’s strict and severe attitudes toward life. Duh’s conservative opinion weakens the inner energy of Sah. Sah’s Venus Conjuncts Duh’s Saturn (-3.30 discord) – Sah’s sense of sexuality, attraction, or intimacy combines with Duh’s sense of commitment, necessity, or duty. Both will show love through practical means and material accomplishment. Duh provides the mental, emotional, and financial stability in the relationship. Sah’s sympathy and affection stimulate Duh’s confidence. Duh can become possessive of Sah. Sah can feel restricted by Duh’s criticism and discipline. Duh’s Jupiter Opposes Sah’s Pluto (-4.21 discord) – Duh’s sense of growth, expansion, or generosity confronts and challenges Sah’s sense of transformation, change, or power and destiny. Personal struggles between Duh and Sah can’t be avoided. There will be conflicting ideas that can lead to misunderstanding or make cooperation difficult. Duh’s Mercury Conjuncts Sah’s Saturn (-4.63 discord) – Duh’s mentality and powers of perception may combine with Sah’s sense of commitment, necessity, or duty. Duh may feel inadequate when Sah imparts knowledge and wisdom. Sah has the tendency to discipline Duh. Duh may feel the pressure of responsibilities demanded by Sah. Duh can talk Sah out of negative attitudes. Duh can encourage progressiveness in Sah. Sah’s Saturn Conjuncts Duh’s Saturn (-5.25 discord) – The individual sense of commitment, necessity, or duty combines with ease within the couple. Sah and Duh share the same ideas regarding security and ambitions. Both want things to be the same way and can understand each other’s problems. This aspect can have a devitalizing effect if Sah and Duh are a young couple who are doing the same wrong things together. Duh’s Sun Squares Sah’s Moon (-5.40 discord) – Duh’s sense of identity, ego, will, and character interact stressfully with Sah’s emotional needs. There is friction in basic temperaments and personalities. Duh’s domineering personality can overwhelm Sah’s emotional and sensitive nature. Sah can appear moody to Duh’s inconsiderate behavior. Sah’s Sun Squares Duh’s Venus (-5.40 discord) – Sah’s sense of identity, ego, will, and character interact stressfully with Duh’s understanding of sexuality, attraction, or intimacy. There is an attraction but also friction between Duh’s romantic sensibilities and Sah’s creativeness. There can be conflict in how to handle finance, cultural, and social issues. Duh’s Sun Squares Sah’s Uranus (-7.52 discord) – Duh’s sense of identity, ego, will, and character interact stressfully with Sah’s sense of independence, freedom, and originality. The rebellious nature of Sah produces friction with the selfishness of Duh. There is a natural tendency to an on-off relationship. Sah might resent and even rebel against Duh’s display of authority. This is subtle and challenging to deal with. The union can sometimes cause a violent reaction between Duh and Sah. Sah’s Mars Opposes Duh’s Jupiter (-8.52 discord) – Sah’s sexual drive, temper, and powers of self-assertion confront and challenge Duh’s sense of growth, expansion, or generosity. Sah is rash and aggressive while Duh can be overly optimistic. There is a tendency of rivalry between Sah and Duh. There is tension in individual ambitions. Duh’s Mars Opposes Sah’s Jupiter (-8.97 discord) – Duh’s sexual drive, temper, and powers of self-assertion confront and challenge Sah’s sense of growth, expansion, or generosity. Duh is rash and aggressive while Sah can be overly optimistic. There is a tendency of rivalry between Duh and Sah. There is tension in individual ambitions. Sah’s Mercury Opposes Duh’s Mars (-10.72 discord) – Sah’s mentality and powers of perception confront and challenge Duh’s sexual drive, temper, and powers of self-assertion. There is tension in Duh’s aggressive attitude and Sah’s rational reasoning. Petty quarrels in the relationship will make cooperation challenging to achieve. Sah’s sarcasm could provoke Duh’s temper. Sah’s Saturn Opposes Duh’s Pluto (-11.05 discord) – Sah’s sense of commitment, necessity, or duty confronts and challenges Duh’s sense of transformation, change, or power and destiny. There is tension in the relationship when Sah and Duh compete for influence and dominance. Duh may try to reform Sah’s strict and severe attitudes toward life. Sah’s conservative opinion weakens the inner energy of Duh. Duh’s Mercury Opposes Sah’s Pluto (-12.53 discord) – Duh’s mentality and powers of perception confront and challenge Sah’s sense of transformation, change, or power and destiny. Sah has a natural tendency to dominate if Duh appears weak. There is tension in the relationship that both Sah and Duh will be uncomfortable with each other. The intensity can sometimes feel overpowering. Duh might have difficulty being heard out of fear of making Sah unhappy. Duh’s Mercury Opposes Sah’s Mars (-18.15 discord) – Duh’s mentality and powers of perception confront and challenge Sah’s sexual drive, temper, and powers of self-assertion. There is tension in Sah’s aggressive attitude and Duh’s rational reasoning. Petty quarrels in the relationship will make cooperation challenging to achieve. Duh’s sarcasm could provoke Sah’s temper. There are 4 mutual receptions in Sah and Duh’s planet combinations. Planets in mutual reception enhance each other. This will add +40 harmony to the total score. The remaining +3.39 harmony are due to some minor aspects or planets in parallel. This is only a quick assessment of the relationship compatibility between Sah and Duh. If both place and time of births are known, an in-depth interpretation is available in the Star Lovers Report. Try a free sample with no obligation to buy. Ssshhh! Sah, don’t let Duh know. You are most compatible with a person born on October 19, 2002. You have a whooping birthday love match score of +158 with that person. Check it out and imagine what it feels like to be with your soul mate.